Stocks were all over the place today. The major indices dropped after the open but turned on a dime just 20 minutes into the trading session. And around 11am ET, the major indices were trading at new highs of the year. But after the S&P and NASDAQ hit highs for 2019, stocks dropped again during lunch. There was a rally back to today’s open during the last hour of the day. But another pullback in the last 15 minutes of trading left the major indices with a 0.2% loss across the board. For 99.9% of Americans, the weekend is a time we all SPEND money, not earn it. Without doing any kind of busywork. The S&P finished with a 0.2% loss. Down 6 points, the S&P ended at 2,927. The DOW ended lower by 0.2%. Dropping 59 points, the DOW closed at 26,597. The NASDAQ was down 0.2%. With a 19 point loss, the NASDAQ finished at 8,102. Crude Oil (CL) dropped for the first time in 3 days. Down 0.7%, CL ended at $65.83 a barrel. Today’s Crude Oil Inventories showed a 5.5 million barrel increase in U.S. stockpiles compared to the 0.9 million barrel increase expected. Boeing (BA) reported worse than expected earnings but ended with a 0.4% gain. Caterpillar (CAT) reported better than expected earnings but finished with a 3.0% loss. And AT&T (T) suffered a 4.1% drop after disappointing numbers. Tesla (TSLA) reported earnings after the bell. The company reported a bigger loss than expected and lower revenue because a tax credit that expired on January 1st is having an impact on sales. In after-hours trading Tesla us up almost 2.0%. Facebook (FB) also reported after the bell and is up big in after-hours trading (up more than 9.0%). Facebook had a strong quarter in spite of concerns that the company might take a $3-5 billion hit because of its ongoing FTC inquiry. Tomorrow will be another big day for earnings. Amazon (AMZN), Ford (F), and Starbucks (SBUX) are just a few of the big names set to report. We’re getting hundreds of phone calls about the charter offer we’re making for Whitney Tilson’s new product… which expires very soon. So today, we’re answering the most popular questions. If you’re on the fence, today we’re also inviting you to take a 100% RISK-FREE look at Whitney’s new product for yourself. Just call us now at 800-668-7136. Just keep in mind: We can’t give any personalized investment advice. But we’ll answer you in as much detail as we can. For a brief time only, you can watch a replay here.Inside, you’ll learn the name and ticker symbol of “The No. 1 Retirement Stock in America.” You’ll also hear an important announcement Porter Stansberry has waited 20 years to share. Watch here today, before it goes offline. QUESTION: What’s Whitney Tilson’s first recommendation? ANSWER: It’s rare: a stock he was once short that he’s now bullish on. In 20 years, he’s only found an investment like this 4 times… And each time, he doubled his money or better. First on Fairfax Financial… which was a double. Then on Wells Fargo… which was a triple. Then on General Growth Properties… which was a 16-bagger. You can watch his full analysis of this opportunity here. QUESTION: Can I get a discount on Whitney’s new product? ANSWER: Yes. For a brief time only, you can claim 40% OFF the price of Whitney’s new Empire Investment Report. This is one of the best offers he’ll ever make. And it’s 100% risk-free, which means that if you’re not happy, you can get a full refund within 30 days. QUESTION: Is this product the right fit for me? Subscriber Chip T. made back the cost of his subscription in just 3 days. For example, Lloyd K. made 5 times his money on a single stock. Adib M. tripled his net worth. For a brief time only, you can see exactly what Whitney has created right here. Stocks are trading pretty flat today, ahead of another busy earnings release date after the close. Stocks reporting their quarterly results include Facebook, Visa, Tesla, PayPal, and others. They are dead money in my eyes. How can the part-time trader who has a fraction of the resources that Wall Street firms have compete without losing their shirt? So what are some of the advantages of trading small-cap penny stocks? Not one single Wall Street analyst is covering the stock! Well, to me, it’s a really crowded area… and it’s hard to gain an edge. For example, Boeing (BA) released earnings this morning. Well, in its first quarter 2019 earnings report, it had some negative comments… and many traders thought it would’ve caused the stock to drop. Here are a few takeaways from BA’s earnings release and conference call. Boeing announced it would pause share buybacks. Typically, if a company pauses share buybacks… the stock should fall. You see, when a company announces it’s conducting share buyback, it’s actually boosting its earnings per share (EPS) figure… in turn, traders price in that event. Boeing withdrew its full-year 2019 earnings and revenue forecast due to uncertainty surrounding its 737 Max aircraft. However, the company did note it would issue new guidance at a future date. BA’s EPS and revenue came in below the consensus estimate. When you read that, does it sound like a stock that should go up? Well, here’s a look at BA on the 15 minute chart. I don’t have a clear answer for this… but what I do know is that there are a lot of exchange-traded funds (ETFs), hedge funds, and other investment managers in the name. Not only that… there is a slew of Wall Street analysts who are constantly researching and providing research to their clients. That said, there’s a lot of noise when you’re trading large cap stocks. The whole idea here is the fact that there are a lot of players in large cap stocks… and it’s hard for retail traders to actually figure out what’s going on with these stocks some times… and of course, it’s hard for retail traders who don’t have the resources like the large banks and funds do. That said, traders like us probably don’t have an edge trading large caps. Well, what’s the solution to trading large caps? Trade small cap stocks, as well as penny stocks. You see, with small cap stocks and penny stocks… you can actually define an edge. The reason being: you’re not competing against large Wall Street firms with virtually unlimited resources… You’re competing against retail traders. Moreover, investment management companies aren’t really interested in small cap stocks… they focus on much larger companies. So how do you find an edge trading small caps? They run on chart patterns and catalysts. If you can spot potential catalysts… the stocks actually move in the direction you’d think they would… unlike large caps. Now, if you can pair both catalysts and chart patterns… that’s when you can really start to make money. For example, just last week, I alerted Jason Bond Picks and Millionaire Roadmap clients about a chart pattern in ReWalk (RWLK). You see, there were a few indicators telling me this stock could be done selling. First, the relative strength index (RSI) was just coming back above 30. Generally, when we see a stock’s RSI go from being under 30 and starting to break back above… that tells us it could catch a bounce soon. Not only that, the company conducted a reverse stock split… and it could’ve experienced a short squeeze at the time. If you try using these patterns in large caps… they probably won’t work. However, the three chart patterns that I teach to all my clients do work well in small caps. If you need a refresher on how I use these patterns, check out a more detailed presentation I made on this topic right here. Stocks came into the trading day staring at all-time highs (S&P 500). That said, I did read something interesting this morning – that only 13 of the 500 S&P 500 stocks are at their highs. As for me, I’m going on vacation for the rest of the week, taking the family to Atlantis aka “Paradise Island” in the Bahamas. Well, I finally jumped on the stock options Monday, after I recognized a “curl” happening on the hourly charts, and the fact the stock was stabilizing after a significant drop from earlier in the month gave me further confirmation that this is a buy. ….but I wasn’t expecting to be taking profits 100% overnight! Now, before I get into a trade, I’m looking at several variables… some technical…some fundamental. However, I rely on the “charts” for my entries, exits, and overall execution. Now, if you don’t already know about the money pattern, it’s a cross over pattern. In other words, I’m able to spot shifts in trends – and figure out whether I should buy call options or put options. Basically, I use moving averages on a specified timeframe and just look for one line to cross over another. Let me explain the pattern a bit more with a chart on Roku (ROKU). Now, traders who do that end up taking large losses. And there’s a better approach to that – the money pattern. You see, all you really need to do is look at the blue and red line on the charts. When the blue line crosses above the red line, it indicates there should be bullish activity soon. Generally, I keep a basket of stocks to look at when I’m trading… stocks that I like to trade… stocks that I know. Well, ROKU happens to be one of my favorite stocks… and I’ve had a lot of success trading this name in the past. So when I saw this money pattern flash a buy signal, I quickly came up with a plan. I figured ROKU may have found a short-term bottom around $55 (the blue horizontal line in the chart from earlier) – that’s what we call a support level. In other words, traders were willing to buy at the blue horizontal line. That said, if ROKU broke below the $55 level, I would sell my call options. Additionally, I had a target in mind. Now, I also planned to buy more call options if the premiums came in a bit, just as long as the stock stayed above $55. On the hourly chart, I liked how ROKU has been very quiet and trading in range following its big drop earlier this month. Again, I also liked how the blue line (13-hourly simple moving average (SMA)) crossed above the red line (30-hourly SMA). Here’s what I was thinking. I would start taking profits if the stock got to $61… and I would buy more if the options premium pulled into the mid-$1 range… and if the stock broke below $55, I would sell my options. That said, I bought ROKU May 3 2019 57.0 calls at $2.15 yesterday afternoon. Keep in mind, ROKU is set to report on May 8, and I wasn’t planning on playing the stock for earnings… it’s too volatile for my liking. That’s why I bought the options contracts expiring a few days before the announcement – that also helped reduce the cost of the options since I wouldn’t be paying a volatility premium. Now, if you need a refresher on options trading, check out my free guide here. Now, the very next day… ROKU gapped higher… and moved 7% – after Susquehanna initiated coverage on ROKU with a price target of $80. If you don’t already know, options provide you with leverage… and a small move in the underlying stock could cause the options to move exponentially. Now, if you need a refresher on trading stock options, check out my free guide: 30 Days to Option Trading. When you’re up 100% in an options position… there’s one thing you need to do… sell a portion of the position. Now, my rule is to sell half of the position for 100%… and let the rest ride just as long as the trend stays intact. What you gonna get when you invest your money in Sykes Weekend Profits? And that by the time the market opens on Monday this stock could be trading much, much higher. And you can get started as soon as you receive Tim’s email with the subject line The Weekend Trade that Could Pay You $6,250 Next Monday. We’re talking about a new way of generating retirement income every weekend. Every Friday you can now set up payday opportunities for Mondays. Inside that email, you’ll find all the details on this play that could put as much as $6,250 in your pocket by next Monday. As a member of Tim Sykes’ Weekend Profits, Tim Sykes will send you 2-3 new weekend trade recommendations every month giving you the change to pocket thousands of dollars on the weekends. Anytime Model Portfolio Updates: In some occasions Tim Sykes might recommend to let your profits run and leave the trade open for a few more days. When that happens, he will send you an alert with an update to explain everything. 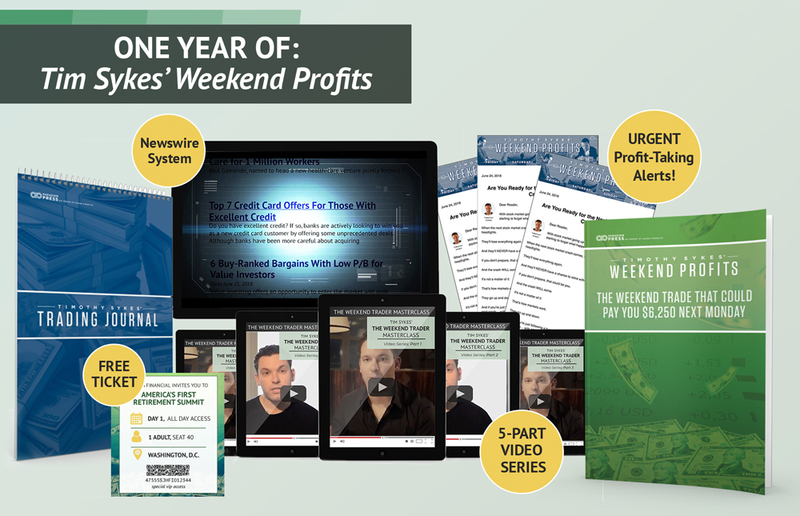 Tim Sykes Weekend Profits Strategy – #1 Weekend Money Making Strategy could help you make profits like $3,791, $8,780, even $15,820 over the weekend. Without doing any kind of hard work. It’s really simple and It takes just 3 simple steps. Step #2: Enjoy your weekend. Step #3: Cash out with a small fortune on Monday. And do it over and over again next weekend simply by following this strategy.